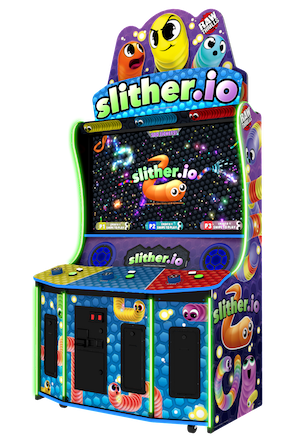 The arcade version of the smash hit web game, Slither.io has been officially released by Raw Thrills. Following on from its unveiling at IAAPA last November, the game will launch with a 55ins display and three player positions in a compact cabinet to maximise operator revenue and location appeal. Building on the massively successful online game base, this LBE edition apparently adds “exclusive gameplay features that keep players engaged and entertained,” but these have yet to be revealed. Achieving more than 200 million downloads to date, Slither.io, was named the Top Trending Game of 2016 by Google Play. Slither.io remains a leading free action game app on both Android and iOS. The game is now shipping and is expected to be present at the upcoming DEAL and AEI shows in Dubai and Las Vegas next week.